Forecasters say the region’s sea ice will dwindle to a strip above Greenland and Canada. There, polar bears and others will fight to survive. We see evidence of the kill first: a shockingly broad spread of scarlet, probably the blood of a ringed seal, on snow-covered sea ice. Then the polar bear appears. She’s big, maybe 500 pounds, trailed by a single cub. They’ve just jumped into a lead—a long fissure of open water in the frozen sea. In seconds they’re out of the water again, running across the ice, spooked by the approach of our helicopter. Prolonged running can harm polar bears: Fat and fur insulate them so well they risk overheating. François Létourneau-Cloutier, our 33-year-old Québécois pilot, takes us higher, and the mother and cub slow to an amble. Off the north coast of Canada’s Baffin Island, a June sun transforms snow and ice into limpid pools of turquoise. After following them for several minutes, Létourneau-Cloutier sets the helicopter gently onto the ice a few hundred feet away and cuts the engine. The mother rises on her hind legs, assessing our 35-foot-long flying machine with the unruffled gaze of the Arctic’s top predator; the cub remains on all fours behind her. For a few timeless moments we savor the scene—bears against an otherwise empty immensity of snow and ice, countless shallow pools of meltwater reflecting a high summer sun ringed by faint halos of red and blue. Then, with a frenzied whine, the helicopter’s rotor blades break the spell, and we lift off, veering southwest toward our campsite on the northernmost tip of Baffin Island, Canada, about 700 miles north of Hudson Bay. On a nearly ice-free August morning, walruses flop ashore on Devon Island, north of Baffin. Walruses dive as deep as 300 feet to feed on clams and other bottom dwellers. In between dives they rest on sea ice; dry land is a less convenient substitute. Within a few decades such vistas are unlikely to exist, at least not here, during summer. As the planet heats up, the summer sea ice and all the superbly adapted life it supports—the bears, the seals, the walruses, the whales, the Arctic cod, the crustaceans, the ice algae—may well vanish around Baffin. As we fly over the vast frozen expanse, it almost strains belief to think that we’re witnessing—and with the rest of humanity, helping to cause—its demise. In the 1980s satellite data showed that Arctic sea ice extended on average across nearly three million square miles at the end of summer. Since then more than a million square miles has been lost—an area roughly the size of Alaska, Texas, and California combined. Climate models suggest that by the 2050s, less than 200,000 square miles of perennial sea ice will remain. The good news, such as it is: What’s left will collect in a compact region, not here but farther north, above Greenland and Canada’s Ellesmere Island. That shrunken redoubt will be the last stand for many of the Arctic’s wild things. A pod of beluga whales swims through Lancaster Sound north of Baffin Island. The whitest ones are adults that have already molted: Every summer belugas seek out shallows where they can rub off their old skin against gravel and sand. “The animals that depend on the edge of the sea ice for a living will be congregating there in the summer,” says marine ecologist Enric Sala, leader of the National Geographic Society’s Pristine Seas project. Sala has come to Baffin with divers and filmmakers to document the icy world that’s doomed here—and to make the case for preserving the “last ice” farther north. Since he started Pristine Seas a decade ago, the project has helped protect more than three million square miles of ocean. But preserving the remnants of Arctic ice, which will require the cooperation of Greenland and Canada, will be its most ambitious undertaking. It’s also the most urgent. 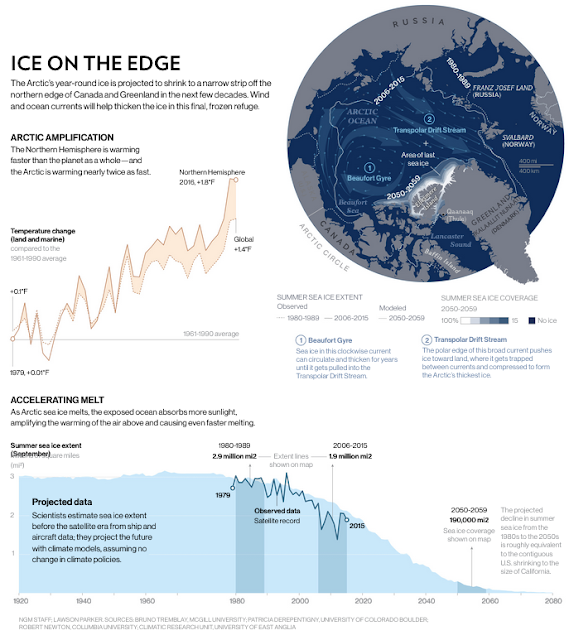 “The Arctic is changing faster than anything else,” Sala says, and as the ice goes away, shipping, fishing, and oil and gas development may intrude. If sea ice and its denizens are to be protected, it must happen before exploitation of Arctic resources becomes unstoppable. In satellite photos, and perhaps in our imaginations, the icescape glazing the top of our world appears static, like a featureless white continent, permanent and immobile. Actually it’s a jostling mass of ice floes that, propelled by winds and currents, drift from one side of the Arctic to the other in journeys lasting years. Dripping wet, a polar bear climbs onto an ice floe in northernmost Hudson Bay. Polar bears perch on sea ice to ambush seals—the source of 90 percent of their calories—when the seals surface. National Geographic Explorer-in-Residence Enric Sala is leading an effort to preserve some of the bears’ dwindling habitat. “In Russia we found bears stuck on islands eating grass and seabirds,” he says. “People don’t understand the Arctic,” says Stephanie Pfirman, an oceanographer at Barnard College and Columbia University. “They think of it as an ice cap. They think that it’s rigid and that when it melts it’s just melting back on the edges. In 2010 Pfirman was part of a team that identified the most likely location for the Arctic’s last summer sea ice, work that has helped guide the Pristine Seas effort. Comparing a variety of computer models and satellite data, she and her colleagues found that winds and currents conspire to funnel drifting sea ice from all over the Arctic onto the northern edges of Greenland and the Canadian Arctic Archipelago—a region of spectacular fjords and more than 36,000 islands, including Ellesmere and Baffin. Year after year, massive ice floes stack up in that relatively calm zone. Some of the ice there is decades old and more than 80 feet thick. Pfirman and her colleagues realized that by mid-century, this frigid haven would hold the Arctic’s only year-round ice. Their discovery was far from obvious. In some earlier climate models, Pfirman says, the Arctic’s ice cover simply retreated evenly along its southern flank as the planet warmed, ultimately settling right around the North Pole. “That makes no sense at all, though,” she says. “There’s no reason for ice to congregate at the North Pole. Pants made of polar bear fur identify Naimanngitsoq Kristiansen, an Inuit man from Qaanaaq in northwestern Greenland, as a seasoned hunter. With sea ice thinning every year, his dogsled journeys have grown increasingly hazardous. Despite the steep decline in store over the next several decades, a long, narrow band of perennial ice will persist late into this century. If we can end our reliance on planet-heating fossil fuels, it could survive even longer—into a time when, just maybe, we’ll figure out how to remove enough carbon from the atmosphere to cool the planet again. “The ice models don’t drop down to zero,” Pfirman says. “Some people say it’s hopeless, because we’re on a trajectory where ice is going to be lost. The ice that does remain in the Arctic may provide a stable environment, albeit a compact one, for organisms that depend on ice. “For people concerned about habitats, it’s not that you will sometimes have the summer ice off the coast of Siberia and sometimes have the ice in the Beaufort Sea,” Pfirman says. “Because you couldn’t sustain a habitat if that ice was moving all around. “This is a newcomer,” says Theo Ikummaq, stooping and pointing to a delicate green shoot on the rocky beach near our campsite. Ikummaq, a 60-year-old native of Igloolik, an island off of Baffin, is a guide and adviser for our expedition. It’s a cold and foggy June afternoon; the inlet we’re walking along is still frozen. Clouds have covered the sun for days now. Ikummaq carries a rifle over his shoulder in case we need to scare away polar bears. We’ve already spotted the tracks of one in the sand only a few hundred yards from our camp. The little green shoot, maybe a couple of inches high, has no name in the Inuit dialect spoken in this part of the Arctic. Ikummaq doesn’t recognize it; he knows only that it’s another example of how the land and life are changing here. During our walk we’ve passed what Ikummaq says are new features in the landscape: large circular sinkholes, created by thawing permafrost. Narwhals mingle in Lancaster Sound, off Baffin Island. They winter in ice-covered waters, feeding on halibut. The corkscrew tusk, a canine that grows up to nine feet long, may serve to impress females, which rarely have one. Later that day, in the big tent where we have our meals, Ikummaq tells me the names for a few Arctic animals. An aarluk—“kills everything”—is a killer whale; a tingugliktuq—“bad liver, don’t eat”—is a horned lark. But some animals, such as robins, are so new to the Arctic that Ikummaq, at least, doesn’t know names for them. With global warming, plant and animal species from the south have started to move north. It’s a trend that will only accelerate, says Brendan Kelly, a biologist at the University of Alaska in Fairbanks. As the habitat for Arctic wildlife shrinks, the animals that survive are likely to undergo profound changes. Diverse species will be thrust into closer contact than ever before. “There’s the potential for a massive scrambling of genes in the whole Arctic Ocean,” Kelly says. “We did a survey of marine mammals and came up with 34 species that are capable of hybridizing.” For reasons that scientists don’t yet understand, marine mammals have tended to retain the same number of chromosomes—a key requirement for hybridization—as they diverged into different species and even genera. “So you end up with things that you would otherwise say are different genera, but are in fact able to produce fertile hybrid offspring,” says Kelly. “An example would be harp seals and hooded seals, which we classify as different genera—but we’ve seen them hybridize in the wild. There is some evidence of a hybrid between belugas and narwhals.” Pizzlies—crosses of grizzlies and polar bears—already roam the Arctic. Genetic studies show that polar bears began diverging from grizzly bears within the past 500,000 years. Global warming threatens to reunite the two species. “We could lose polar bears,” Kelly says. “They might be reabsorbed into the grizzly bear genome out of which they came. We’re not just talking about ecological change. The end result, says Kelly, is likely to be a tremendous, irreversible loss of genetic diversity. But even if that weren’t the case, the Arctic’s wildlife would still be in trouble. “We’re changing the habitat so fast that even if they have the genetic diversity to respond, they may not have the time.” For some of the world’s iconic species, the last-ice region could make the difference between survival and extinction. Walruses dive and court near the Norwegian island of Spitsbergen. Their skin, light gray or brown in frigid water, reddens when the blubbery animals haul out on land and blood flushes through their thick outer layers of skin. “Peaceful, isn't it?” Enric Sala is smiling as he joins me on the beach in front of our camp’s double row of two dozen orange tents. We’re looking east across the frozen reaches of Navy Board Inlet toward Bylot Island, several miles away. Covered with mountains and glaciers, a refuge for denning polar bears and hundreds of thousands of nesting birds, it’s larger than the big island of Hawaii. The sun is out, the weather has finally lifted, and there’s barely any wind. After more than a week of waiting, Sala and his team of divers are eager to explore some open water around a couple of small islands off Bylot’s western shore. In a few weeks, algae will be in full bloom, the water will cloud, and underwater filming opportunities will vanish. But now, the sea here is just beginning to blaze with life. “Sunlight is like a lighter for this ecosystem; it’s why we’re here now,” says Manu San Félix, a diver and photographer who has joined us on the beach, wearing his dry suit. Over the next few days, if the weather holds, he, Sala, and other expedition members will record the beauty of what will be lost if we fail to protect the Arctic’s last ice. The harder work, more arduous even than diving in freezing water, will take years: persuading governments to cooperate to save a region that extends across borders. Preserving the last-ice region itself won’t be enough; because ice migrates long distances, its sources eventually will have to be protected as well. Right now, for example, Siberian ice contaminated with nickel and lead from the Russian industrial city of Norilsk—one of the world’s most polluted places—sometimes drifts into the Canadian Arctic. There it poisons the food web as it melts. “It’s a good sign that we are seeing narwhals, belugas, and polar bears,” says San Félix. It means the food chain here is still healthy. We talk about a pod of bowhead whales that were spotted during a helicopter flight the other day and about how their huge heads enable them to smash through two feet of ice. Bowheads can live 200 years or more. (One way their age has been determined is by carbon-dating old harpoon points embedded in their bodies.) The oldest of them now, says San Félix, might have been born when Napoleon was still alive. If we’re lucky, that is, and foresighted enough.